Looking to convert a tired and dusty playground or old bitumen court into a well utilised soccer or futsal field? Grass Solutions makes it easy to buy artificial grass for a soccer field! We can transform your Bitumen court into a safe and inviting field that encourage children to play, participate, learn or increase their competitive skills of the game. When it comes to installing artificial turf for a soccer field, ‘PlayON’ 40mm synthetic grass is the smart, economical choice. PlayON contains unique additives that enable the yarn to meet FIFA yarn requirements for vertical deformation, natural ball roll and low abrasiveness, reducing the potential for injuries in wet or dry conditions, particularly during falls and slides. The result is a natural-looking sports surface that’s highly durable, yet soft on players. 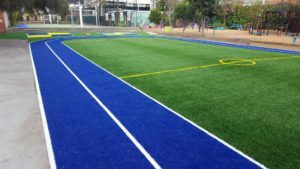 Pro Play 40mm synthetic grass for soccer/FUTSALcan be interfaced with a shorter pile product such as Court Turf PE which is more suited for track and field requirements. 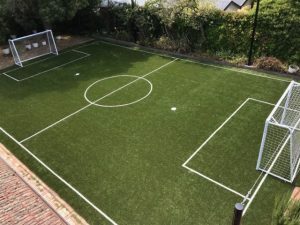 You too can have a mini artificial grass futsal field, scaled to size and your backyard will become one of the most popular addresses on your street! 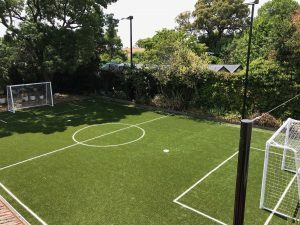 Having the artificial grass futsal field in your backyard will encourage the kids to get off the computers and go outside to practice, train and/or play. At the same time you can keep an eye on things! Going the ‘whole 9 yards’…..Ask one of our friendly team about Artificial Grass Futsal Field Accessories including; lighting, portable goals and perhaps a draw curtain. We can provide a total ‘Court Solution’ for you and your family.